Leather sofas look fantastic, and luckily they are also easy to clean compared to standard fabrics. Cleaning your upholstery regularly can also help you get the most out of your sofa and can keep it looking great for years to come. If you don’t know the best way to clean a leather sofa, don’t worry! We’ve put together a quick and simple guide to help you out. Check out our top tips below. Check your sofa – get rid of surface dirt! One of the first things you should do is to remove any throws and cushions from your sofa. These are best washed separately in order to avoid any potential problems with the products used for a leather sofa. Next, check down the sides and under the sofa and cushions for anything like loose change, sweet wrappers and any rubbish. Once cleared, use a brush attachment to get rid of any crumbs. This will help to avoid scratching or damaging the leather. Most upholstery, including leather sofas, will have a handy label or a sticker that will let you know what cleaning products can be used on it. This is most likely to be on the underside, but could be found elsewhere. If it says “W”, this means that you can only use a water based cleaner on the leather. “S” and “P” means that you can dry clean only. If you see “SW” and “WS”, this means that either a water-based detergent, a solvent cleaner or a steam cleaner can be used. If you see “X”, this means that the leather upholstery will need professional cleaning. Once you’ve found out what can or can’t be used, you can move onto cleaning the leather. One top tip for cleaning a leather sofa is to use saddle soap or a leather dew once a week with a soft cloth. This will help to keep your sofa in a good condition, as well as keeping it nice and clean! 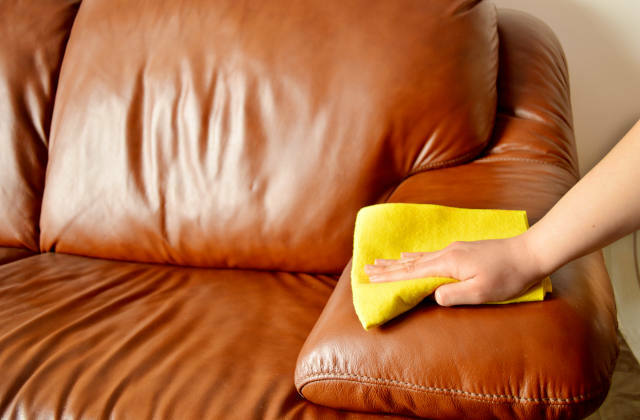 One of the best ways to clean a leather sofa is to use a slightly damp cloth with a little bit of soap. It is important to make sure that the cloth is not too wet though, as this will leave a water mark on your sofa. Another popular technique is to use white vinegar as a natural stain remover, using a mix of water and vinegar solution which is then cleaned up with water and a mild detergent to get rid of that vinegar smell once you’re done. Need help? Call the professionals! Unfortunately, some stains are just too tough to clean, and trying too hard to get rid of them can damage the leather upholstery on your sofa. If you’ve tried the tips listed above but had no luck, it might be time to get help from a professional cleaning company. At Apple Clean, we have over 20 years’ experience cleaning leather, upholstery and much more, and can deal with even the toughest of stains. Get in touch with us today on 0800 587 4571 for a free no-obligation quotation on leather sofa cleaning and more. With Christmas firmly behind us, forget about the festivities, the mince pies and the mulled wine. It’s time to adjust back to normality. 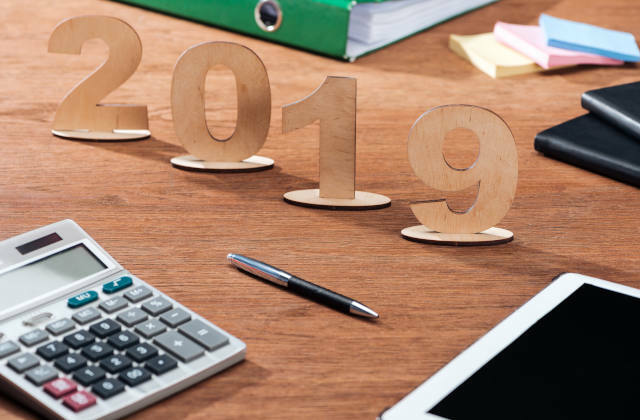 Why not embrace the New Year with an office blitz and an energy switch-up to kick 2019 off to a good start. Here are 10 recommendations to get you going. First off, get rid of the Christmassy atmosphere – glitter is so last year! Fold away that sad looking Christmas tree and return it to the cupboard ready for next December. De-tinsel the office and ditch the decorations. Take down all the Christmas cards and put them in the recycling. Why not start the year with fresh energy in a nice clean office? If your premises are stale, grubby and uninspiring, you’d be surprised at the difference a thorough office clean can make. Ask Apple Clean about carpets, curtains and upholstery cleaning, stain removal and more. Check the kitchen for leftover mince pies, chocolate liqueurs and half-empty bottles of Baileys. No-one will thank you if you hand them around the office now that everyone is on a January detox. Better still, invest in new, healthy additions to your office kitchen. A water cooler? Daily fresh fruit for everyone? A juicer? Ban Christmas jumpers and novelty gifts, festive tunes, cinnamon scented candles and anything else you can think of that doesn’t belong in the New Year. You’re looking forward, not back. And while you’re at it, take down the 2018 wall calendar and get out the 2019 diaries and motivational pictures to inspire everyone at work to look to the year ahead. Take a good look around the office and ask yourself honestly: is the environment conducive to working at maximum efficiency and productivity? Does it exude an air of calm professionalism? It’s always easier to see after a few days away from the workspace. If the area is littered with defunct IT equipment, storage boxes full of papers or other detritus that doesn’t belong there, you should think about decluttering. Similarly, it’s a good discipline to start the year with a tidy desk and work space. Spend just an hour this week to get organised and you will reap the rewards for the next 12 months. The same goes for your computer – now is a good time to sort out your inbox and your hard drive, back up your files and streamline your filing system. Now that you can see clearly, think about adding positive accents to your office that can make all the difference between dreading or looking forward to a day’s work. Fresh flowers or house plants perhaps? New keyboard? Spotify Premium? No matter how small these touches are, they can be immensely motivating to you and the rest of the staff. Spread a little happiness. Be nice to your colleagues. Take some time out to have a catch-up chat, ask about their Christmas and exchange holiday news. It doesn’t take long to reconnect with colleagues and re-establish the bond that holds the office together. Thinking of office morale, how about planning something the whole team can look forward to? A corporate day out in the summer perhaps? Charity engagements? Training and career development opportunities? Some companies opt to have their annual dinner in January – without the crackers and silly hats of course. New Year’s resolutions aren’t everyone’s cup of tea, but goal setting in a work context is certainly worth doing. Whether you have an HR department to organise this for/with your executives or you simply all sit around the board table and talk about your plans for the year ahead, now is a good time to re-engage every member of your team. Time to focus and get back to work. At Apple Clean, we wish all our customers a happy and prosperous 2019. Is it time to deep clean your office? As a business owner or manager, keeping your office in tip top condition should be high on your list of priorities. No doubt you will have a regular office cleaner who hoovers and dusts, wipes down equipment and keeps your kitchen and bathroom areas hygienic. But is it enough? Just like you would at home, you need the occasional deep clean to really get to grips with all those areas that don’t get enough (if any) attention during the weekly office clean. You’ll be surprised how a good deep clean can leave the space not just refreshed but rejuvenated! The new energy will give your staff a positivity boost too. After all, nobody wants to work in a grubby, grimy office. Deep cleaning an office is a professional job that goes beyond day-to-day requirements. It gets rid of dirt and grime that accumulates on surfaces with regular use and can tackle all those hard-to-reach places that get missed out on the weekly office clean. Did you know that there are over 10 million bacteria on a typical office desk? Office carpets are one of the hardest working surfaces in the world of business. With people bringing in all kinds of dirt on the bottom of their shoes day in day out, carpets can take a real pounding. That’s why having your office carpets cleaned on a regular basis is probably one of the most important jobs you should schedule. Don’t wait until you spot signs of mould or mildew (but take immediate action if you do!). If you want to get the most out of your office carpets, and the best return on your investment, make sure you have them properly cleaned. At Apple Clean, we have over 25 years’ experience in carpet cleaning, upholstery cleaning and curtain cleaning. Why not give us a call on 0800 587 4571 and see how we can help? How often should you deep clean your office? As a small company with only a few employees and light foot traffic around the office, an annual deep clean should probably suffice. In a busy office with people constantly coming and going, deep cleans should be scheduled more regularly, say every 3 months. 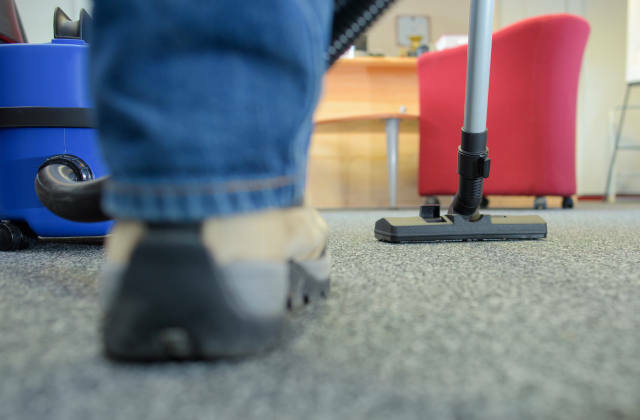 The correct frequency of your office deep cleans really depends on the amount of activity in and around the office. Take your cue from the overall appearance of the premises. If things are starting to look a bit too shabby or feel a bit too grubby, it’s high time to call in the professionals. How clean or dirty are these 4 key areas in the home? We all want to live in a home that’s hygienic and smells fresh – but do you know where to look for hidden dirt? 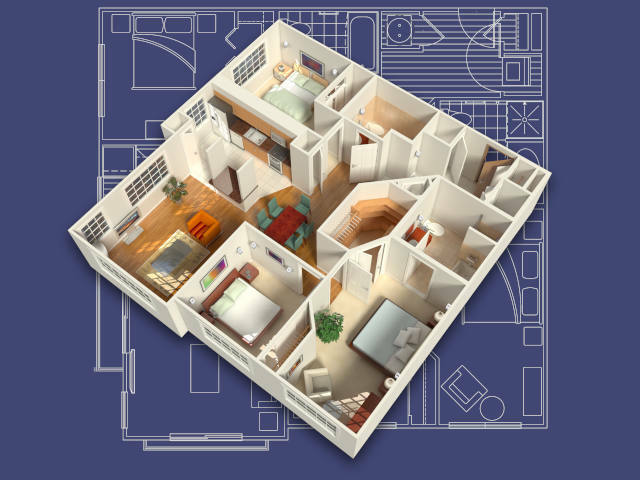 Let’s take a look at the four key areas in the home to see where most of the dirt harbours, and what you can do about it. While the kitchen is likely to be the busiest room in the house, it is probably also the dirtiest. All the elements for bacterial growth such as heat, moisture and food are present, ready to do their worst if you let them. Think of how germs get spread from handling raw meat to storing unwashed fruit and veg, plus the germs on surfaces on the worktop, in the sink, on cupboard handles and utensils, even in the fridge. Does everyone in your family wash their hands when they come into the kitchen? If not, they should! In order to keep your family safe and healthy, keeping your kitchen hygienically clean should be your number one priority. Bodily functions and personal hygiene routines performed in the bathroom means that some bacteria will linger after every use. This affects not just obvious places such as the toilet seat, but light switches, door knobs and taps too. Disinfecting wipes are a good idea for daily protection while the sink should be wiped every day. Hand towels should be changed every other day while bath mats and towels should be washed in hot water at least once a week. Don’t neglect toothbrush holders and cups; they should be cleaned thoroughly on a weekly basis. For bathroom mats, rugs or carpet that can’t be put in the washing machine, get professional cleaners in at least 4 times a year. Wherever the family gathers – living rooms, TV room, study – hidden dirt and bacteria will accumulate. Just think about every surface that gets touched – from door handles to light switches, computer keyboards and remote control devices. Make sure everything gets wiped down with a disinfectant wipe every day, and that if anyone has a cold they clean up after themselves. Upholstery is another breeding ground for bacteria from unwashed hands, sneezes, pet hair, unwashed feet, outdoor shoes…. Did you know that many types of bacteria can live for several days on surfaces such as these? Sofas, armchairs and other upholstery should be vacuumed at least once a week, including underneath and between cushions where food debris and pet hair can linger for longer. Apply a deodorising spray for a fresh scent. Seek professional upholstery cleaning help at least twice a year for routine maintenance and to keep your furniture and furnishings looking better for longer. Bedrooms can be a haven for fungus, bacteria, mites and insects – and most of these can be found right in your bed! Make sure you wash your bedding and bedlinen often to avoid problems such as skin irritation and eczema, fungal and bacterial infections, allergies and respiratory issues. Bedlinen should be changed at least once a week and washed in the machine – the ‘clean’ smell will tell you all you need to know. If you’ve ever pulled clean bedlinen from the cupboard only to find that they smell stale, it’s an indication that body oil and soil residue is still in the fabric fibres. Bedding such as pillows and mattresses should be encased in removable, washable and allergy proof covers to combat potential dust mite infestation. For professional, friendly advice on any home cleaning requirement and a no-obligation quote, Jonathon at Apple Clean is always happy to help. Why not send us a brief message with your enquiry, or call us on 0800 587 4571. The bathroom is one place in your home where cleanliness and hygiene are non-negotiable so that a healthy environment is maintained for all the family. Like the kitchen, it should be cleaned frequently to prevent problems that can be caused by water or moisture, leading to potentially harmful germs and mould. 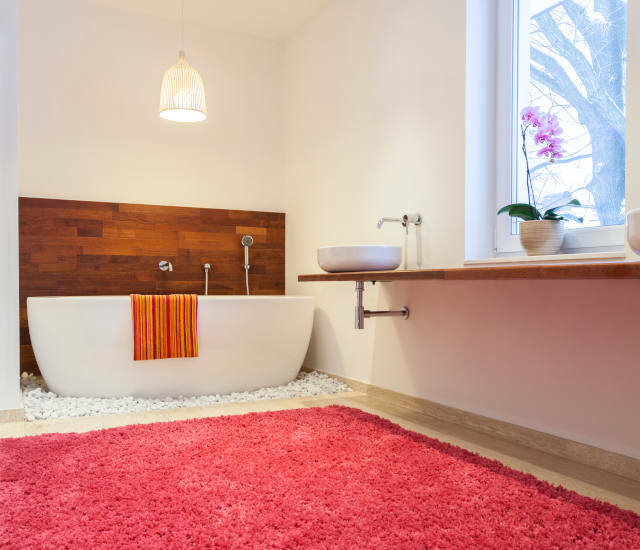 If you have a rug or carpet in your bathroom, you need to be particularly attentive, with a regular washing or cleaning regime to protect your family. We dealt with fitted bathroom carpets in our last blog, so this time let’s focus on rugs and mats. It goes without saying that different carpets may require different kinds of treatment, so it’s a good idea to be vigilant. If your carpet is in frequent use, and is damp a lot of the time, you should wash it every week. Mould and mildew can grow easily in moist conditions. Check the care label on the rug to see if it is machine washable. If so, wash it either on its own or together with some towels to balance the load. After machine washing, leave your bathroom carpets and rugs to air dry. An outdoor washing line on a sunny day is best. Unless the care label says otherwise, you can also tumble dry heavy bath mats and rugs. However, those with rubber backing and adhesives should not be machine dried. Rubber backed rugs or carpets need careful handling and shouldn’t be washed in hot temperatures, since the rubber backing will deteriorate more quickly. Wash once every few weeks in cold water. Oriental rugs can look striking but use with care since these floor coverings are not made for a bathroom environment. Vacuum and air regularly and get them cleaned professionally. Mix white vinegar and water in a 1:1 ratio and decant into a spray bottle. Apply to any smelly areas, leave to dry for a few minutes, then clean with warm water. Mix water and fresh lemon juice in a ratio of 1:1 and apply to the affected carpet area. Leave for 15 minutes and clean with a sponge. You’ll be left with nothing but a lovely citrusy aroma. Sprinkle some baking soda onto the rug or carpet and leave overnight. In the morning, apply some white vinegar and wash the area with warm water. For professional advice on rug cleaning and carpet cleaning anywhere in your home, along with a free instant quote, please contact Jonathan at Apple Clean on 0800 587 4571.